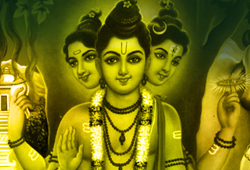 Dattatreya is a Guru who had the power of all the 3 Higher Gods in Hinduism – the Creator, the Sustainer, and the Destroyer….Brahma, Vishnu, and Siva. He was the ultimate Guru….it’s going to be a fire ritual for Dattatreya, and I want people to experiment this, and then pray for miracles. In a special Agastya Live Channel Reading, Agastya revealed to Dr. Pillai that the upcoming Full Moon day, Oct.24, 2018 (IST) is the birthday of Dattatreya, who is the divine incarnation of the Trinity – Brahma, Vishnu, and Shiva. On this special day, AstroVed will be conducting grand Fire Prayers along with special poojas to invoke Miracle-Maker Dattatreya for material desire fulfillment and resolving life problems. Scriptures say that chanting the powerful Dattatreya Shodasakshari (16-letter) mantra can fulfill material desires, bring you prosperity and abundance, help you enjoy good health, give you harmonious relationships and act as a remedy for all your life problems. 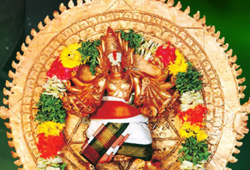 According to mythology, Lord Dattatreya was born to Sage Atri and Anusuya. He is considered the ultimate Guru and pinnacle of wisdom, who is full of compassion and love. Scriptures describe him as the source who brought knowledge and light to the world. Dattatreya is portrayed with three heads, six hands, and four dogs, standing in front of the divine cow and wish-fulfilling tree. He holds a trident for killing the ego, his drum is used to awaken those living in ignorance, and his conch shell reverberates the sound OM. He holds a rotating discus-chakra, a round weapon representing the universe and his power to destroy karmic bonds. 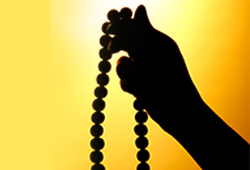 Dattatreya holds a japa mala, with which he counts his devotees, liberating them merely by thinking of them. He carries a pot filled with the nectar of pure wisdom to revive those souls who thirst for knowledge- delivering them from the endless cycles of life and death. In a special Agastya Live Channel Reading, Agastya revealed to Dr. Pillai that the upcoming Full Moon day, Oct.24, 2018 (IST) is the birthday of Dattatreya, who is the divine incarnation of the Trinity – Brahma, Vishnu, and Shiva. On this special day, participate in AstroVed’s grand fire prayer by chanting the powerful Dattatreya Shodasakshari (16-letter) mantra to fulfill material desires, enjoy good health, harmonious relationships and act as a remedy for all your life problems. You will receive the sacred grey ash powder from the homa which will be blessed in the rituals. Keep this on your meditation altar and wear it on your forehead during meditation or at other times to expand the Divine blessings into your life. Please Note: Your prasad will be shipped from Chennai, Tamil Nadu, after the entire set of rituals are performed. For international shipping, please allow 2 – 4 weeks for delivery. Agastya revealed to Dr. Pillai that the upcoming Full Moon day, Oct.24, 2018 (IST) is the birthday of Dattatreya, who is the divine incarnation of the Trinity – Brahma, Vishnu, and Shiva. 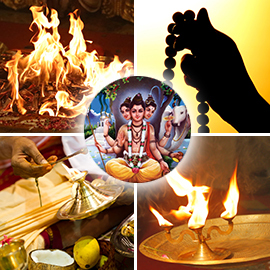 On this special day, participate in AstroVed’s grand fire prayer chanting the powerful Dattatreya Shodasakshari (16-letter) mantra to fulfill material desires, enjoy good health, harmonious relationships and act as a remedy for all your life problems. 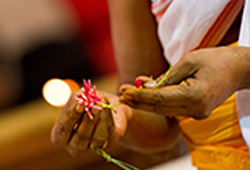 You will receive the product and sacred grey ash powder from the homa which will be blessed in the rituals. Keep this on your meditation altar and wear it on your forehead during meditation or at other times to expand the Divine blessings into your life.